George Soros (1) once said that his first job (which took him three years) was establishing his character, by which he meant that people learned to trust him, he proved himself trustworthy. 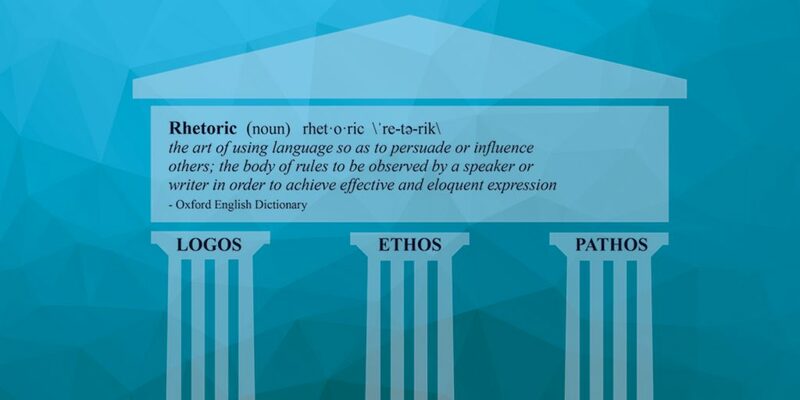 These three pillars of logic, character and emotion, what I’m going to call logos, ethos and pathos (after Aristotle) are the three pillars of effective influence and persuasion. In politics (and maybe deodorant marketing) truth, trust and meaning are falling apart. Championed by President Trump is the ‘authentic’ shoot from the hip, say whatever comes into your head, it’s the anti establishment appeal. Of course, this is itself rhetoric, it aims to persuade and influence and it has done so sufficiently to win him the presidency. What can we learn from all of this about how we persuade and influence within our businesses? My observations of the conversations that go on in social media are that they are driven by the need for recognition and response. In fact, neuroscientists are now saying that when we get a response in social media (a ‘like’ or a ‘share’) endorphins are released in the brain that stimulate pleasure and ultimately become a form of addiction. So how to get noticed? For many it is through expressing an ever more stark and extreme point of view. Nuanced, balanced conversations are difficult, particularly on Twitter, so what you get is an exchange of sound bites where positions are stated as absolutes and discussions become highly polarised. Without trust, great conversations at work are impossible as is illustrated by Paul Zak’s ‘Neuroscience of Trust’ HBR article (3) where staff engagement is strongly linked to individual’s sense of trust in peers, leaders and the ethos of the organisation. Paul Zak finds a strong correlation between trust, energy levels, productivity and improved collaboration. The ability to have great conversations, the ones that tackle difficult issues, that challenge the status quo and strongly held positions by colleagues are needed even more in a time of discord and strife. This article was inspired by Mark Thompson’s book, ‘Enough Said’ (4). Now CEO of the New York Times and an ex Chief Executive of the BBC, Mark has gone back to the Greeks to help us understand what’s happening in the decay of political discussion and debate. In this article I am using some of his work to ask whether in the sphere of work we are encountering the same problems. Social media provides the opportunity for citizens to engage with one another without having to go through the official channels of councillors, MPs and the processes of representative democracy. So too in organisations, where staff can communicate far more effectively than before without having to go through formal leadership or official communication channels. One MD I coach keeps a close eye on Glassdoor where his staff comment on his actions and behaviour. Much of the comment is anonymous so it provides the same opportunity to ‘dish the dirt’ as does broader social media. His boss seems to have too strong an interest in what staff are saying about his team. The problem is that many social media platforms do not provide the medium for a good conversation; it is mostly statements without any substantiation. Words, meaning, facts, alternative facts, lies – we all have our views on the conduct of the political debate, some of the trends are marked. For example, the move away from debate and discussion to slinging ever more exaggerated positions that will attract the attention of our press, media and most of all our following on social media that has been dumbed down into 140 character slogans. So much of leadership is down to words – what do you say, what do you say you do? There are few leaders now who are physically at the front of the fight for new customers so much of our leadership currency is words or rhetoric. As a leader. how do you seek to persuade your colleagues of a course of action that takes your business forward? Rhetoric is the study of persuasion and much of our thinking goes back to Aristotle. He saw three pillars of persuasion: logos, ethos and pathos. To persuade others you need to deploy all three unless you are a demagogue, in which case you may just need two! You set out the opportunity, the evidence of the problem, the causes of the opportunity, the criteria for decision-making, you may suggest alternative solutions, you will argue for and against and explain the conclusion you have reached. You are appealing to the rational, perhaps the appeal may also be to your or others self interest, there may be a carrot and the stick or an appeal to a nobler cause, but the emphasis is on the facts and the logic. It’s who you are, your character, and your reputation. The level of trust you have built up, your credibility, are you truthful or prone to act like the worst of our politicians? It is your values and ethics, the trust you have built up with your colleagues and business associates. If I rate your credibility highly, I’m much more likely to listen to your logic. Your ethos is your authenticity (or not). We respond to passion, the emotion, the stories and the narrative. Much has been written on storytelling as part of the leadership art. We humans respond to stories, they give us context (real or imagined) they appeal to our notions of good and evil, pleasure and pain, success and failure. Pathos is also about your ability to tune into others’ feelings, your emotional intelligence. Great conversations move within this triangle. They are built on trust and mutual respect; they need to use hard data and problem solving and to emotionally engage all parties. Daniel Kahneman (6) reminds us of our two-speed thinking, the spontaneous and thoughtless and the slower and more deliberative. Social media encourages instant reactions, many almost autonomous reactions, unthought-of and emotive. We see less and less of the deliberative conversation in social media and more and more of positional statements. How do you move around this triangle in your attempt to persuade and convince? Are you conscious of the need to deploy all three? Where are your preferences and where are your blind spots? We at OE Cam have created a development tool to help managers navigate the triangle. Sometimes we are not conscious of how we address different situations, all logic or all emotion and are we credible anyway? We all resort to clichés and routines that on the surface seem convincing but don’t really stand up to inspection. In fact, they degrade conversations into power plays and games that demoralise and alienate. Calling the silent majority to your side – “everybody knows I’m right” and hence “you are wrong”. There is often no logos here just pathos falsely appealing to be on the side of the majority. Splitting, catastrophising. “It’s all (my point of view) or nothing”(your point of view). “You’re either for me or against me, there is nothing in between”. If you don’t agree then I’ll throw my bricks out of the pram/resign/and this will be the end of the world as we know it. It’s obvious and common-sense. No logos given, all reasonable people would agree with me. The obvious and the common sense is how it appears to me. To suggest that a different view isn’t, suggests that the other is either uncommon or stupid. Taking the extreme as the reason not to do the majority condition. Examples of extreme benefit fraud used to justify doing away with social benefits. Gross exaggeration where everything has become absolutely awesome or irredeemable. For a more complete list have a look at ‘Straight and Crooked Thinking’ by Robert Thouless (7). I’ve just read Tom Bower’s biography of Tony Blair (8). He contends that there was a lack of Cabinet conversations throughout his time as Prime Minister. He reports that many of the big issues his government faced were left undiscussed by his cabinet and dealt with through one to one conversations. This led to confusion at best and hostile division at worst. The great conversation works with each of these three dimensions. Difference is mediated through balanced argument and deals with probabilities not certainties. Such conversations don’t believe that debate gets in the way of action – it’s when you act without proper debate that you get bogged down. The great speeches of history have navigated the triangle of logos, ethos and pathos and have built trust and the social capital to get things done. Few leaders now manage through big speeches except at the annual management conference. The art of persuasion is carried out in small groups, individual conversations and through the communications media. “(the university)….caused me to never to accept an assertion, however palatable, and no matter the stature of the authority making it, without creatively seeking evidence to support it” (Louise Richardson, Vice-Chancellor of University of Oxford). But however well crafted, we need to keep our critical faculties alive both with regard to our own rhetoric and that which is coming from our leaders. Ultimately, this is it what builds the trust and confidence to have great conversations with great outcomes. OE Cam run Power and Influencing Programmes that hone your ability to have great conversations with great outcomes. Our diagnostic tool builds awareness of your own preferred styles and gives you the framework to build a stronger impact as you use your logos, ethos and pathos to get things done.